Xiaomi’s official bootloader unlocking process is a real pain, not to mention the fact that you have to wait for your application to be approved. Why bother with it, when you can do it in just a minute, and using just 3 files. This tutorial is only for Redmi Note 3 Kenzo (Spnadragon 650) devices. Disclaimer: Geekiest and the author are not responsible for any damage you incur. Proceed at your own risk. 2. You may have to disable driver enforcement in Windows 10 to install the unsigned drivers. For this, press Windows + I to open the Settings app > Recovery > Advanced Startup > Restart Now. Go to the troubleshooting steps, and when the PC reboots, select number 7 or F7. 3. Install the MiFlash tool on your PC now. 4. Extract the RAR file to C:\ and out the Redmi Note 3 on Fastboot mode. If you have minimal adb installed, enter the "adb reboot bootloader" command, or power off the phone and press power + volume keys simultaneously until you see the fastboot screen. 6. Extract the fastboot_edl folder and run the batch file in it. 7. Open the MiFlash tool, and select the folder where you extracted the RN3_unblockblonly RAR. 8. Click on the refresh button in the MiFlash tool, and it will display your phone as COM5 or something similar. 9. Click on the flash button and it should complete successfully. Reboot the phone, and check the developer settings to see if the bootloader is unlocked. 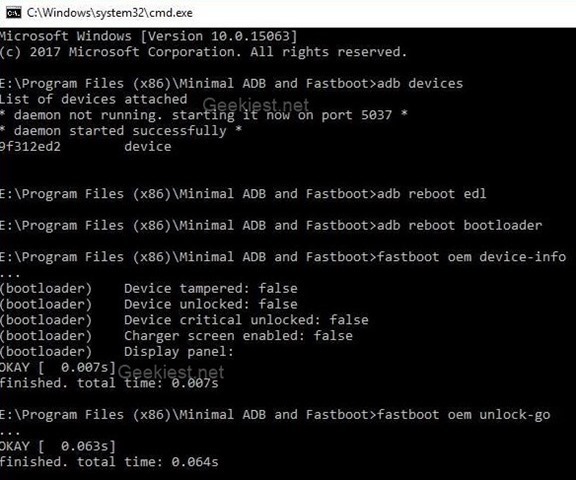 If it hasn't been unlocked, reboot to fastboot mode, and type "fastboot oem device-info", then type "fastboot oem unlock-go". This should unlock the bootloader and delete all files on the phone. This was tested in a Redmi Note 3 running on MIUI 8 in September 2017.